This is our Bag Tag kick off event. 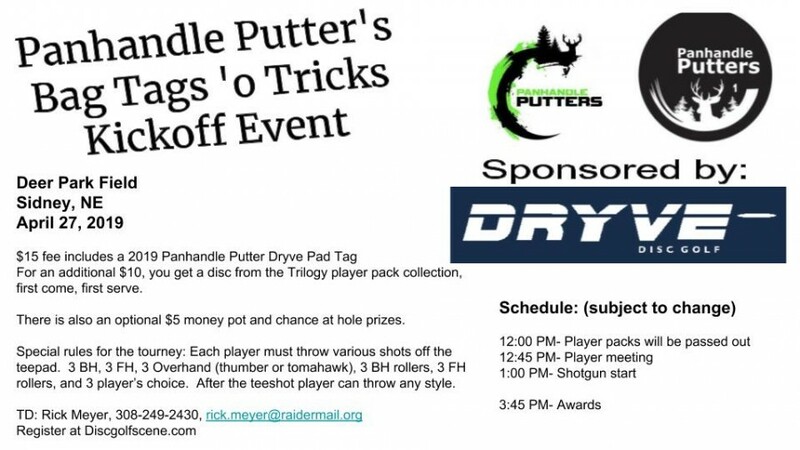 The cost is $15 for a bag tag, that includes the Panhandle Putter's Dryve pad tag. These fit best with Innova mini markers, but also work by themselves as both a marker and a pad for your knee when throwing from the ground. For an additional $10, players can have a disc from the trilogy player pack collection, first come, first serve. 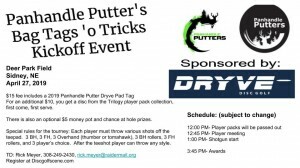 There will also be an optional money pot and hole prizes for $5. If you would like a player pack disc, email [email redacted] for a list of discs available. This will be an 18 hole tournament. Players will play the nine hole course twice around. Players will have to throw 3 BH, 3 FH, 3 BH rollers, 3 FH rollers, 3 overhand, and 3 player's choice drives. After the teeshot, players can throw whatever they want. Tags will be awarded after the event, lowest number goes to the best score. Walk-ups are allowed the day of the tourney, but limited to 30 players. Panhandle Putters is responsible for all refunds and cancellations.